InstallShield® is the world's leading Windows installation development solution. InstallShield is designed to enable development teams to be more agile, collaborative and flexible when building reliable InstallScript and Windows Installer (MSI) installations for PCs, servers, and Web applications. InstallShield is the only software installer that can directly convert MSIs to Microsoft App-V virtual packages. Install Web Applications to Microsoft® Azure™ and Microsoft IIS using Microsoft Web Deploy – With new support for Microsoft Web Deploy, Suite/Advanced UI installations give your customers the flexibility to deploy web applications to their choice of infrastructure—local machines, remote servers in the data center or Microsoft Azure in the cloud. Design DPI-Aware Installations – All InstallShield project types are now DPI-aware, ensuring an optimized user experience when your customers install software on high DPI devices. Check for the Latest Setup Every Time an Installation is Run – Suite/Advanced UI installations can automatically check for the latest version of a setup any time the installation is run, including from the installation’s maintenance mode, making it simpler for users to find, download, and install your latest product releases. Upgrade Multi-instance Installations – Develop upgrades that can detect the presence of multiple instances of a product on target systems, providing end-users with options to select the instance to upgrade. Now supports both major and minor upgrades. Provision Virtual Machines from the InstallShield IDE for Testing Installations – Reduce testing time and eliminate manual steps by automatically provisioning virtual machines: choose test image snapshots, power on virtual machines, and stage setups directly from the InstallShield IDE. Supports VMware® vSphere, VMware Workstation, and Microsoft Hyper-V®. The top-tier InstallShield Premier Edition is the world's most powerful and flexible solution for Windows installations. Software companies serious about providing reliable, professional installations for their applications trust InstallShield Premier Edition. Simplify multi-tiered installations—Use multi-tier installation templates to deploy web/server applications as a single cloud-ready package. Automate installing Windows roles and features—Avoid the risk of manual tasks by automatically installing Windows roles and features with an application's installation. Run PowerShell scripts from Suite / Advanced UI installations—Streamline server configuration tasks by running PowerShell scripts - the enterprise scripting language of choice. Simplify installation of complex applications—With new support for Microsoft Web Deploy, Suite/Advanced UI installations give your customers the flexibility to deploy web applications to their choice of infrastructure—local machines, remote servers in the data center or to Microsoft Azure in the cloud. Create Microsoft App-V installations—Build both physical and virtual application packages from the same build process. Virtualization suitability testing—Ensure applications are compatible with enterprise application virtualization technologies, such as Microsoft App-V, VMware ThinApp and Citrix XenApp. Provision virtual machines for more efficient installation testing—Reduce testing time and eliminate manual steps by automatically provisioning virtual machines from the InstallShield IDE. Sideloading Windows store apps—sideload Windows Store app packages (.appx), enabling Windows Store apps and desktop applications to be bundled and installed through a single installer outside the Windows Store. Enhanced suite capabilities—Ability to import and reference PRQ files as Suite packages, dynamic links for Suite packages, advanced reporting and logging on Suite packages as well as a new UI for custom conditions. Support complex requirements with minimal scripting or coding—With the InstallShield Suite/Advanced UI Project type, multiple products can be easily bundled together into a single, unified suite installation, eliminating the need to develop a custom launcher or bootstrapper application. Provide a streamlined experience—End users only need to download a small file to quickly start the installation. Leverage the advances offered by 64-bit operating systems—The most comprehensive support for 64-bit installation development including 64-bit dependency scanning, setting permissions for files, folders and registry keys, and a prerequisite that installs the 64-bit version of the Microsoft VSTO 2010 Runtime. Maintain a clean build system—Each license of InstallShield Premier Edition includes five free Standalone Build licenses. Support distributed, collaborative installation development—The InstallShield Collaboration add-on allows distributed product developers and technical writers to more efficiently create and manage their content of the installation. Premier Edition includes 5 licenses of Developer Installation Manifest Editor. Avoid common installation issues—Validators in the InstallShield Best Practices Validation Suite alert you if your installation violates any best practices guidelines. Localize your installation—InstallShield's multilingual support lets you create installations for 35 runtime languages from one installation project. Quickly roll out new installations—With network repositories, it's easy to build a repository of common elements that multiple installation authors can access and reuse in projects. Save time with the IIS Scanner—Only the Premier Edition allows you to import the IIS data from an existing Web site into your InstallShield project automatically using the IIS Scanner. InstallShield 2014 Premier Edition is available as a node-locked or concurrent license. 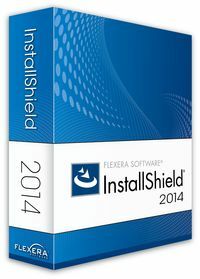 InstallShield Professional Edition is a powerful and easy-to-use solution for building Windows installations. It is ideal for both novice and seasoned software installation developers. While most homegrown Windows installation tools are not optimized for current industry standards, InstallShield Professional lets you take advantage of all the latest technologies. Windows 7 & 8.x validation testing—Validate installations against Windows 7, 8, and Windows Server 2012 R2 best practices from Microsoft. Advanced UI designer—Create contemporary install experiences using new Wizard design capabilities. Create pure 64-bit installations—Deploy your 64-bit applications using 64-bit installations that support server configurations where WoW64 has been disabled. Deploy to hybrid cloud databases—Microsoft Azure SQL Database scripting capabilities enable hybrid cloud SQL deployments. Provide deployment metadata—Microsoft® System Center 2012 Configuration Manager support enables software producers to provide required deployment metadata to their Enterprise customers, reducing the burden in managing their application. Ensure users always have latest version of your application installed—Automatically checks for the latest updates and patches at install time and from maintenance mode, and if an update is found, it will automatically be downloaded and run in place of the old installer. Streamline installation scripting—PowerShell support offers software producers the ability to streamline installation scripting requirements and support best practices of their Enterprise customers. Maintain a clean build system—Each license of InstallShield Professional Edition includes one free Standalone Build license. Reduce development time—Quickly and easily build your installations by moving pieces of an existing project (dialogs, custom actions, or features) to another installation project; create and manage re-usable project outlines so you don't have to start your installations from scratch. Support easy upgrades—Create installation upgrades that can detect multiple instances and allow users to select which instance to upgrade. Easily customize your installations—Modify the layout of existing end-user dialogs; manage multiple product versions, allowing specific features to be included in a release via user-defined flags; and much more. Customize your installations with InstallScript—Add InstallScript custom actions to your MSI projects or create InstallScript projects that control your entire installation. InstallShield 2014 Professional Edition is available as a node-locked or concurrent license. InstallShield Express Edition is ideal for software developers and setup authors looking for a quick, easy, and cost-effective solution for creating reliable Windows Installer (MSI) installations. Unlike "build your own" installation solutions, InstallShield Express Edition shields you from the complexities of developing a setup. It comes with an easy-to-use Project Assistant – a wizard that guides you through the MSI installation creating process, step-by-step. Easy to learn and use—The Express Edition sizably reduces the time required for setup authors to successfully complete installation projects. It also lets experienced developers save time by more efficiently jumpstarting new projects. Support for latest Microsoft technologies—Support for Windows® 8.x, Windows Server® 2012 R2 and Visual Studio® 2012. Avoid risk exposure and non-compliance—InstallShield creates ISO 19770-2 software identification tags as part of the installation development process. Ensure a positive first impression when software is installed on high-DPI devices—InstallShield enables developers to create DPI-aware installations that scale up for high-DPI devices. Fits into any budget—The Express Edition is ideal for software developers and setup authors looking for a cost-effective solution for creating reliable Windows Installer (MSI) installations. Available in different languages—The Express Edition is available in English and Japanese to offer developers the flexibility to build in their own language. Quickly and easily create Windows Installer (MSI) installations with advanced support for SQL databases, IIS web sites, XML editing and much more with InstallShield's intuitive graphical development environment. Achieve maximum flexibility in your installations with InstallScript—a powerful and easy-to-use scripting language. Create script-based installations and Windows Installer Custom Actions. InstallShield’s Suite/Advanced UI projects now support installing Microsoft Web Deploy files to simplify the deployment of web applications. Suite/Advanced UI installations can bundle MSIs, EXEs, Microsoft Web Deploy files and more. They can be bundled with dependencies, server configuration tasks, database scripts, and all the required components of a complex multi-server application. All InstallShield project types are now DPI-aware, ensuring an optimized user experience when your customers install software on high-DPI devices. Validate that your product is compatible with the leading application virtualization formats including Microsoft App-V, VMware®, ThinApp™ and Citrix XenApp™. Validate installations against the Windows Logo tests to ensure applications follow Windows and Windows Server best practices. Ensure the integrity of installations and support preferred User Account Control (UAC) behavior by digitally signing installations and their files. Suite/Advanced UI installations can automatically check for the latest version of a setup any time the installation is run, including from the installation's maintenance mode, making it simpler for users to find, download, and install your latest product releases. Develop upgrades that can detect the presence of multiple instances of a product on target systems, and provide end-users with options to select the instance to upgrade. Now supports both major and minor upgrades. InstallShield’s development tools are available in both English and Japanese language editions. Localize installations using InstallShield’s default run-time strings in 35 languages, and add your own strings for other languages. Add conditions to deliver different files, registry entries and other resources for each supported language. Confidently deploy your applications to the latest Windows versions, including Windows 8.1 or Windows Server 2012 R2. Build pure 64-bit installations for Windows Server® Core configurations where WoW64 may be disabled. With the new support for Microsoft Web Deploy, Suite/Advanced UI installations give your customers the flexibility to deploy web applications to their choice of infrastructure—local machines, remote servers in the data center or to Microsoft Azure in the cloud. Support continuous integration practices and reduce manual editing by leveraging automation scripts to add files and features, change installation properties and settings, and initiate project builds. Reduce testing time and eliminate manual steps by automatically provisioning virtual machines; choose test image snapshots, power on virtual machines, and stage setups directly from the InstallShield IDE. Supports VMware® vSphere, VMware Workstation, and Microsoft Hyper-V®. Compile, build and manage InstallShield projects on TFS build servers. Use Team Explorer to configure, schedule, and queue builds for InstallShield projects together with Visual Studio solution builds. Create installations directly from the same Visual Studio interface used for other development projects. Automatically extract COM information, leverage InstallShield’s extensive library of redistributables, and seamlessly upgrade projects from any previous version of InstallShield. Integrate installation development into agile development processes by creating a distributed collaborative team. Enable developers, technical writers and other contributors to create and manage their own sections of the installation. Following are the minimum requirements for systems that run InstallShield (the authoring environment), as well as for target systems that run the installations created with InstallShield (the run-time environment). Target systems must also support the SSE2 instruction set.